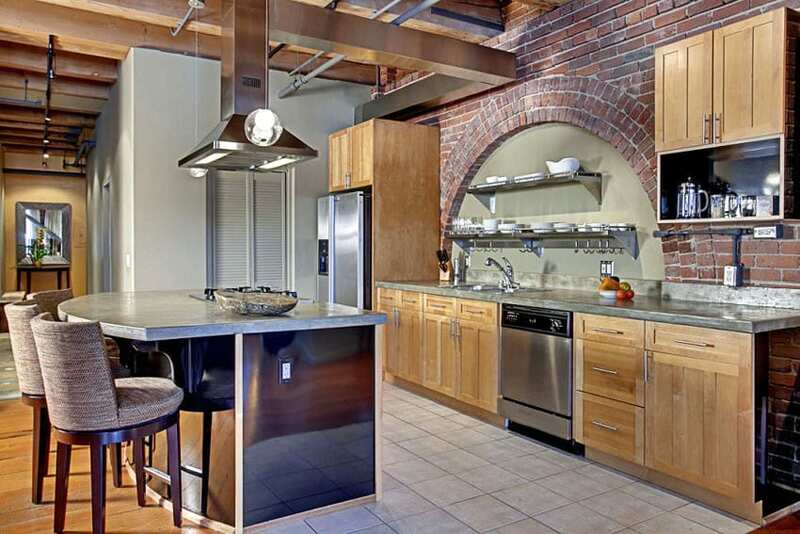 In this gallery we explore brick kitchen design ideas. 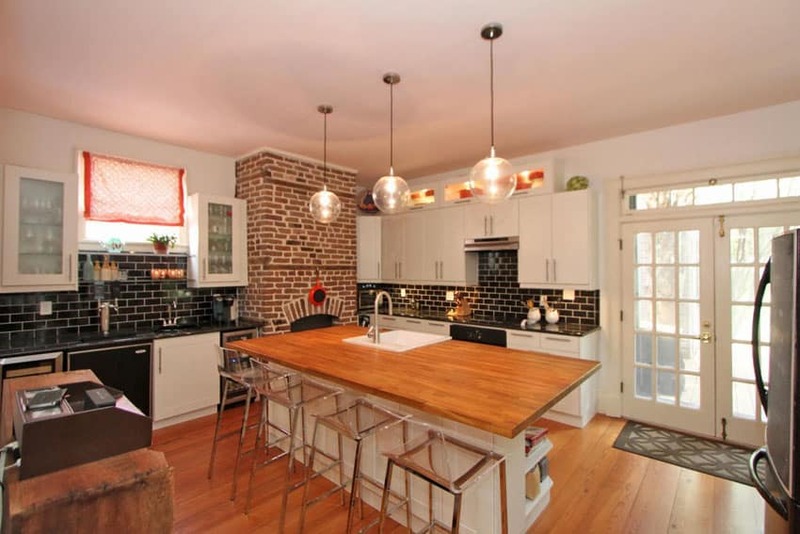 These kitchens feature exposed brick in the form of tile, backsplash & accent walls. 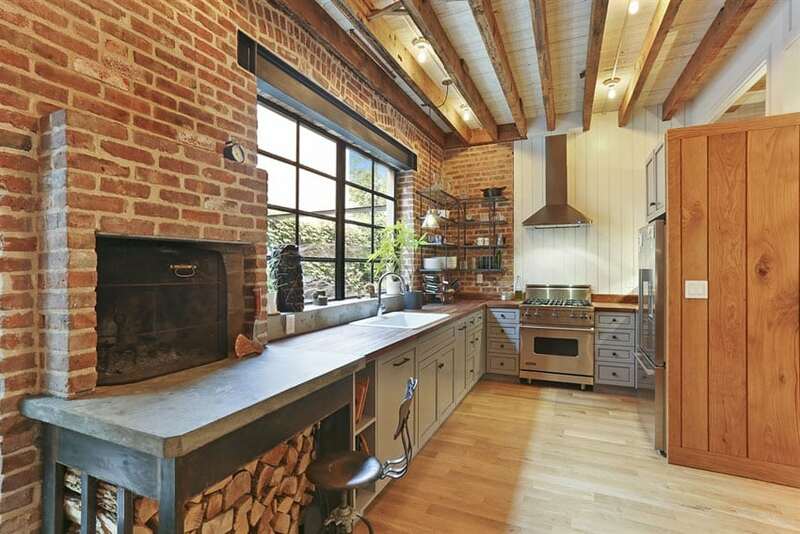 An exposed brick wall in the kitchen can look amazing and bring character in to the space. Using natural and rough materials in interior design is a popular trend and brick walls and accents can have a dramatic effect. 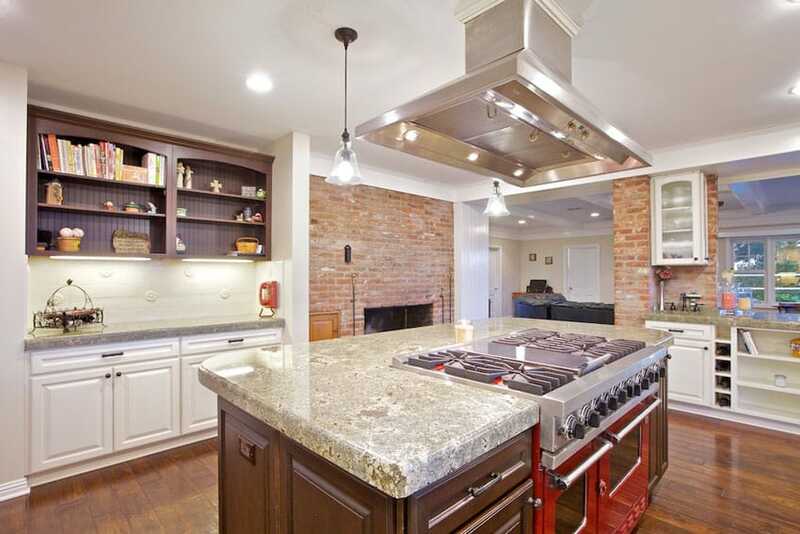 Kitchens without a current brick wall can avoid costly remodeling by installing faux brick. 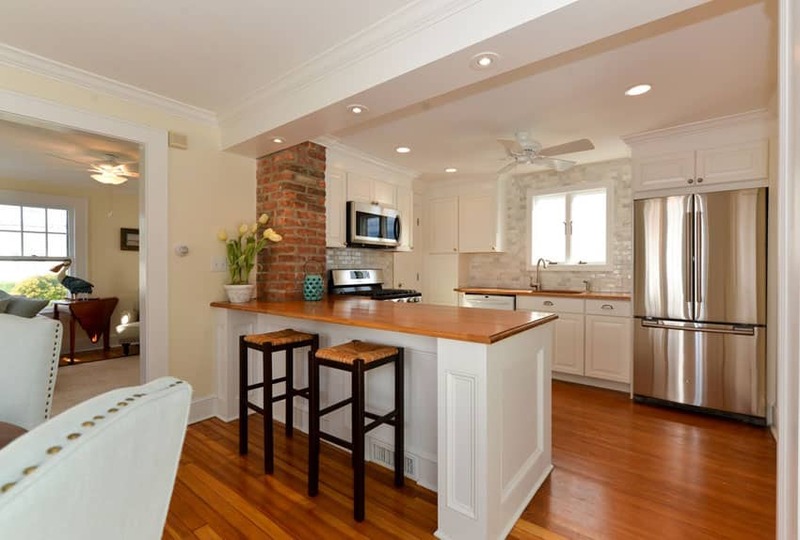 In the picture above is a modern kitchen with solid wood mahogany cabinets is placed against a red brick wall, breaking plainness and monotony and adding more personality to the kitchen space. 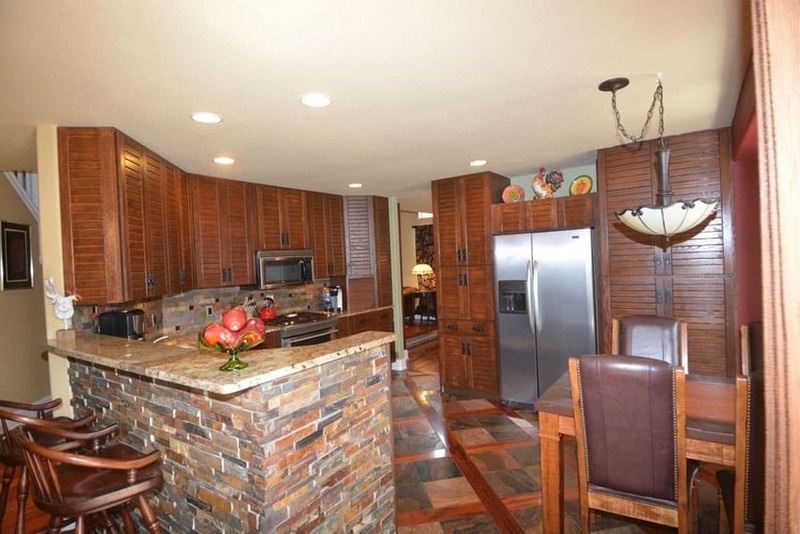 It also adds texture and pattern, while still perfectly complementing the red tones of the kitchen cabinets. All Brick Design – an all brick kitchen can look amazing and is best matched with a natural-lit atmosphere, plenty of bright lighting and bright cabinets for contrast. 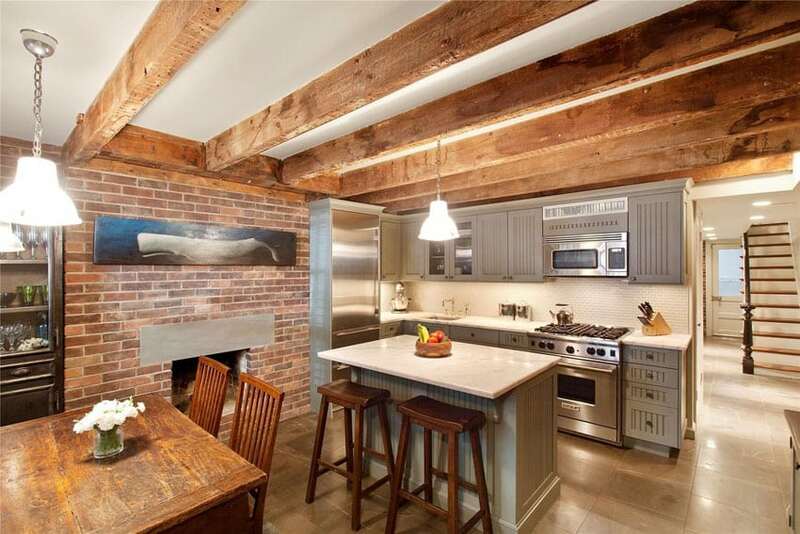 Brick and Beams – for a more industrial space brick with exposed wood beams create a down to earth and warm ambiance. Brick and Stainless Steel – this offers a mixture of natural and an industrial aspect for the kitchen design. 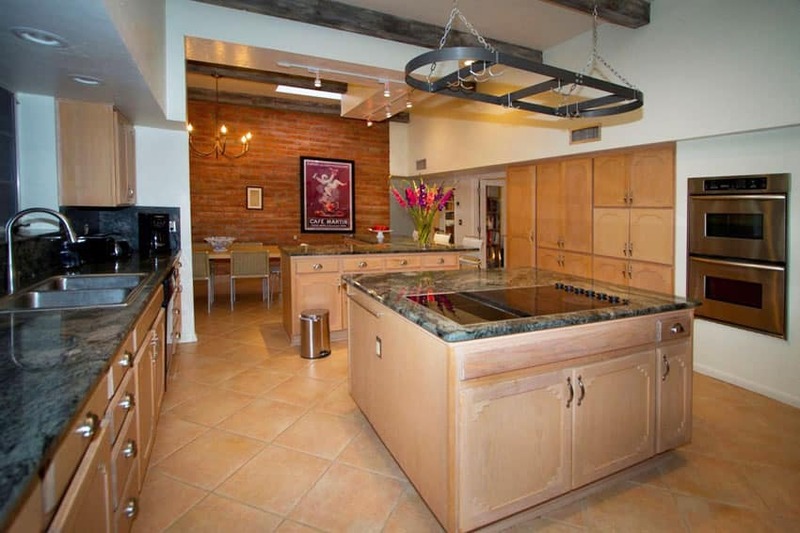 Brick and wood beams are exposed for contrasting against stylish stainless steel surfaces. Brick Pantry Nook – a little alcove is built in between the kitchen and the dining room which is best suited as a space for cookbooks, glassware collections, and pantry accessories. 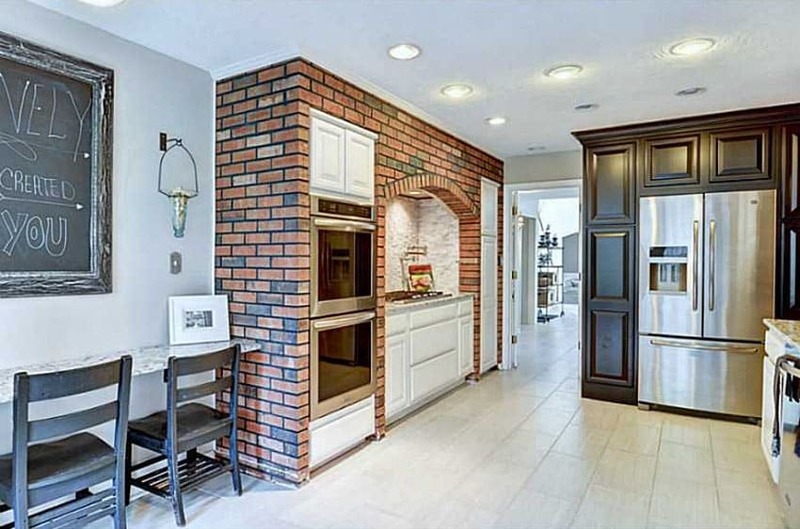 Brick Hearth – suitable for country kitchen wherein the archway and brick wall is built offering an appearance of a heart that surrounds the range. 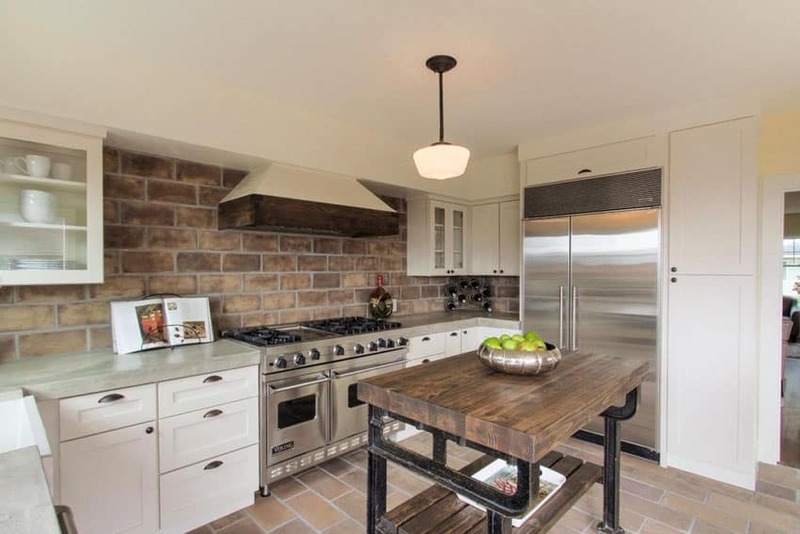 Rustic Brick Kitchen – it can be designed using vintage windows as well as a farmhouse table. The wall space serves its purpose as an open shelving. Farmhouse Kitchen – this design makes use of combined brick backsplash, traditional style cabinets, and good-looking wood countertops. Scandinavian Influence – known for their simple lines and modern cabinetry, brick is often added as a backsplash to give a Scandinavian design a rustic touch. 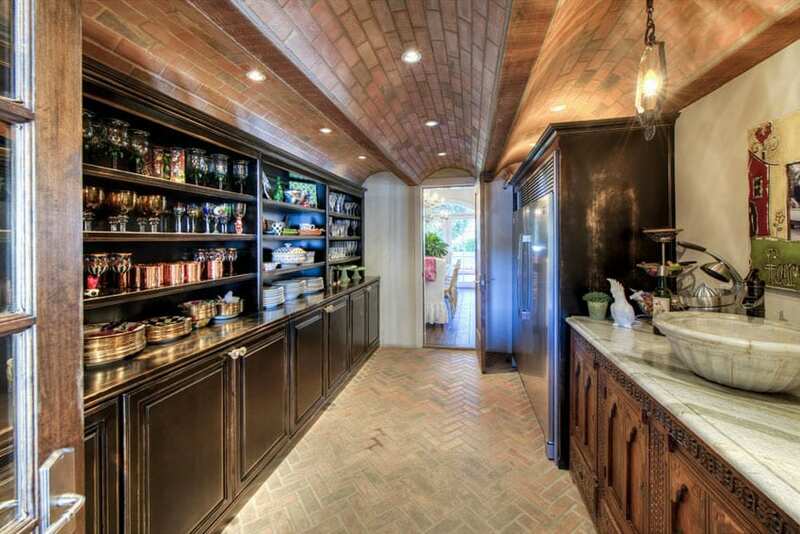 Open Shelving – Open shelving allows one to really let the brick standout and look great. A modern kitchen space which uses a brick accent wall. 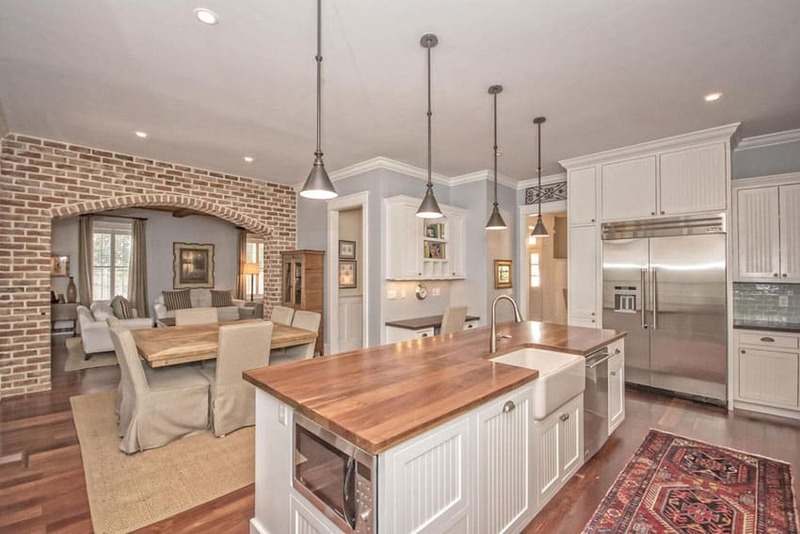 The accent wall uses antique brick cladding which is a great contrast against the smooth solid teakwood kitchen cabinets and the light oak wood engineered wood planks of the floors. 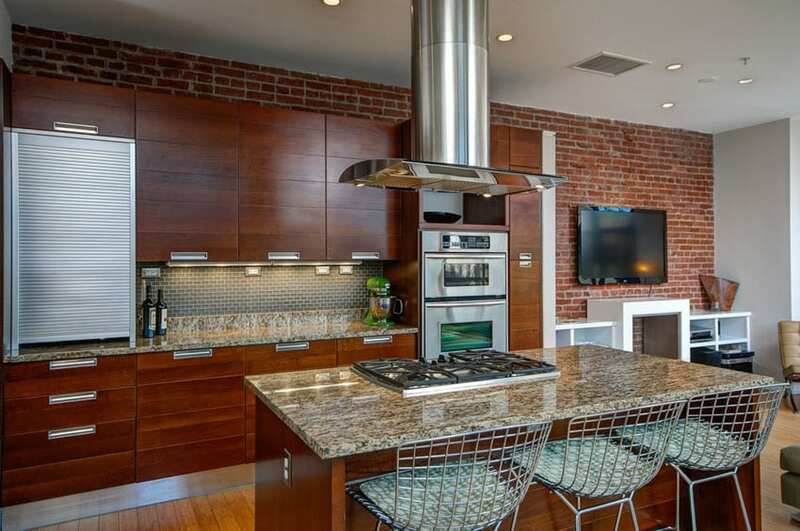 For this kitchen, the brick is a subtle addition, used as a back splash. Dark walnut kitchen cabinets with white quartz and ash wood floors already create an excellent contrast, but the addition of gray brick tiles for the back splash adds a welcomed pattern and texture into the kitchen space. The brick accent wall give this minimalist modern look a nice punch of attitude. 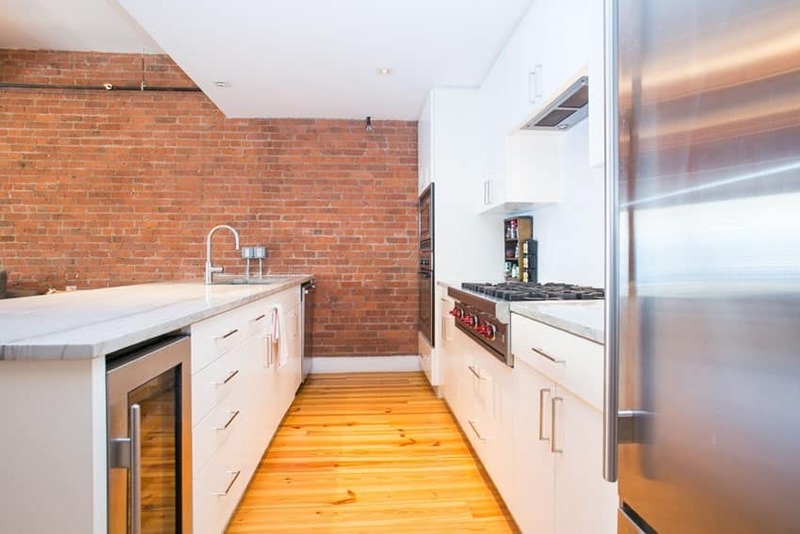 Since the kitchen cabinets are plain white with white soap stone counter top and white walls, the brick walls adds texture and pattern,breaking the monotony of the kitchen design and balances the brightness of the white surfaces with the dark reds of the bricks. The engineered bamboo floors also aid in balancing the look of the kitchen, making it look more interesting. 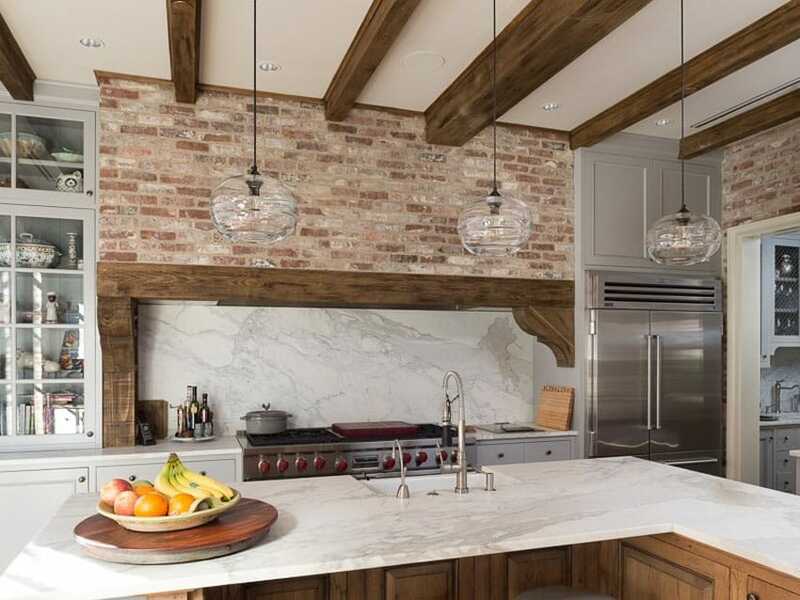 Instead of antique or terracotta bricks, this kitchen opted to use large, masonry sized brick pieces of one wall and paints it over with white, giving you an interesting accent wall. 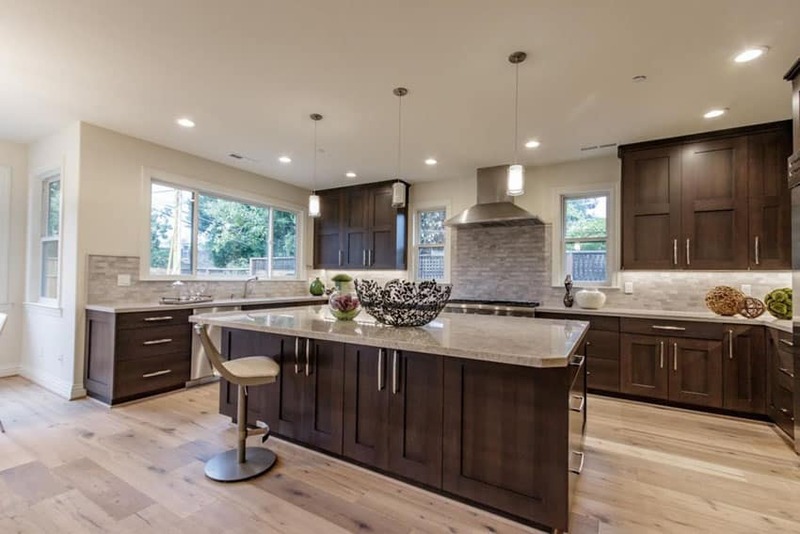 It also gives an interesting contrast against the rustic finishes of the rest of the kitchen, which focuses on beige, brown and other natural colors. This rustic style kitchen combines a more modern white-painted brick finish with antiqued bricks, creating a really interesting feel to the kitchen. Aside from the bricks, it also uses reclaimed wood shutters as wall, creating one more interesting feature to the kitchen. 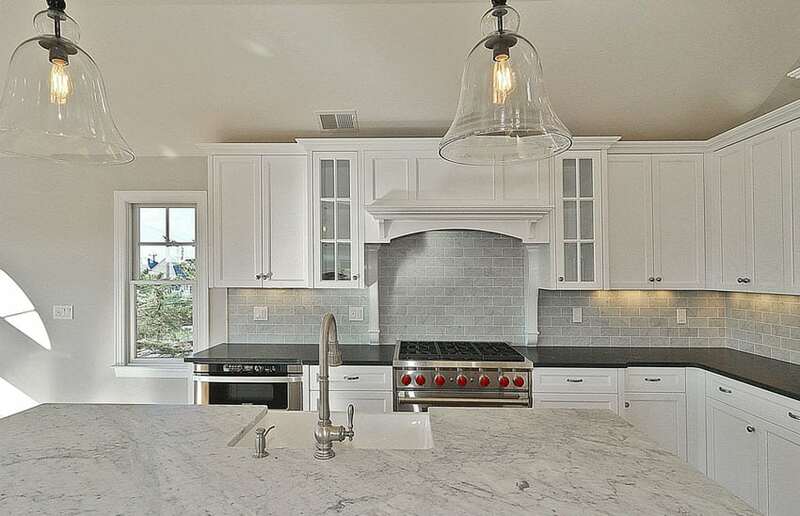 White marble was the counter top of choice, breaking the roughness of the brick walls. helping you transition to the smooth black kitchen cabinets. In this kitchen, the brick cladding was applied on the bar counter face & sides, as well as the backsplash. The earthy tones of the brick tiles give a rustic appeal to the space which perfectly complements the solid Mahogany kitchen cabinets. Brick kitchen design ideas using natural stacked stone can look impressive and not break the bank during a remodeling project. A modern transitional style kitchen which uses white-painted kitchen cabinets with clean, white counter top. This is combined with French door overhead cabinets and suspended shelves, to create a balance of classic and modern elements. 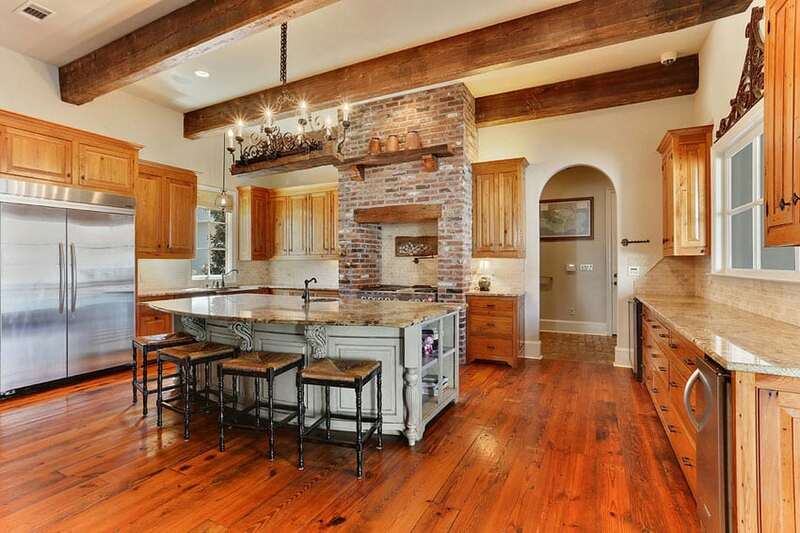 At the far wall of the kitchen is a wall with antiqued brick finish, giving the space a rustic touch. A traditional style kitchen which uses a combination of colors and finishes, giving it a dark and heavy look usually associated with Baroque interior style. Bricks were used widely in this space, on the floors and even around the cook range. 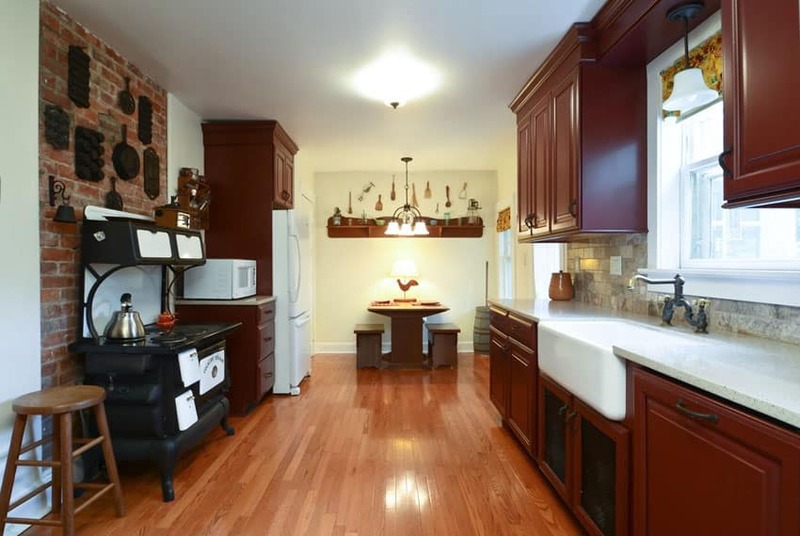 The dark red of the bricks are countered by the light beech wood kitchen cabinets and the beige wall paint, creating a balance of dark and light colors. A rustic style contemporary kitchen which combines the clean smooth surface of marble and gray-painted cabinets, with the rustic oak wood cabinets and beams. The wall behind the range cooker uses antique finish bricks, giving it a rustic appeal. Luxury appliances and the use of modern lighting and natural marble counters keeps the interior design new and exciting. 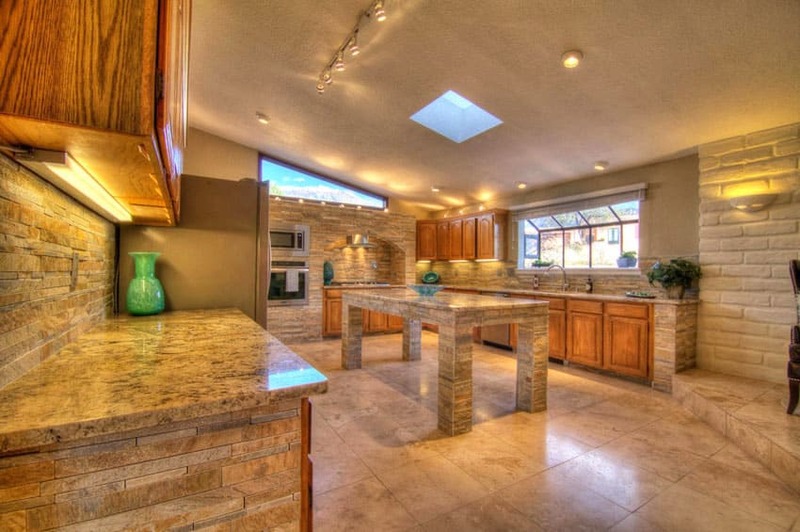 The sloped ceiling with skylight gives this kitchen its charm, making it look bright and inviting. 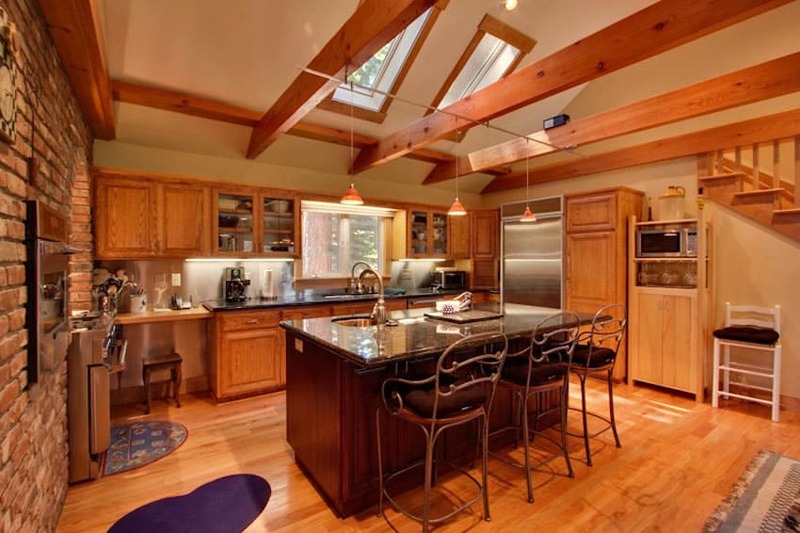 Wood beams spans the ceiling area, which also serves to support the drop lights in the kitchen. One side of the wall is completely clad in bricks and serves as the built-in niche for the oven. The old arched window of the wall clad in bricks was filled with concrete and used as the main kitchen wall. It uses solid maple cabinets and mahogany laminated kitchen island. Gray solid surfaces was used for the counter top, giving it an industrial look, while the former arched window serves as the wall in which the hanging racks are attached. 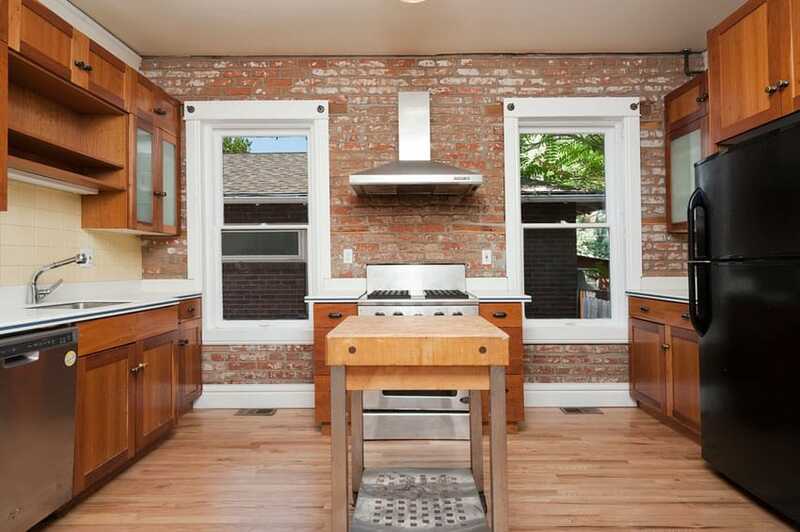 The brick walls are preserved in this kitchen, using it as the niches in which the built-in cabinets are placed. The antique bricks has a faded beige color which matches well with the light cream-painted cabinets. The bar counter’s front is clad with bricks, but is darker than the walls. This modern kitchen is quite expansive, using a uniform look for its cabinets by applying maple wood laminates and tops it with green granite counters. The dining area wall just beyond one of the island counters is clad with terracotta bricks, giving it a bold red-orange color. 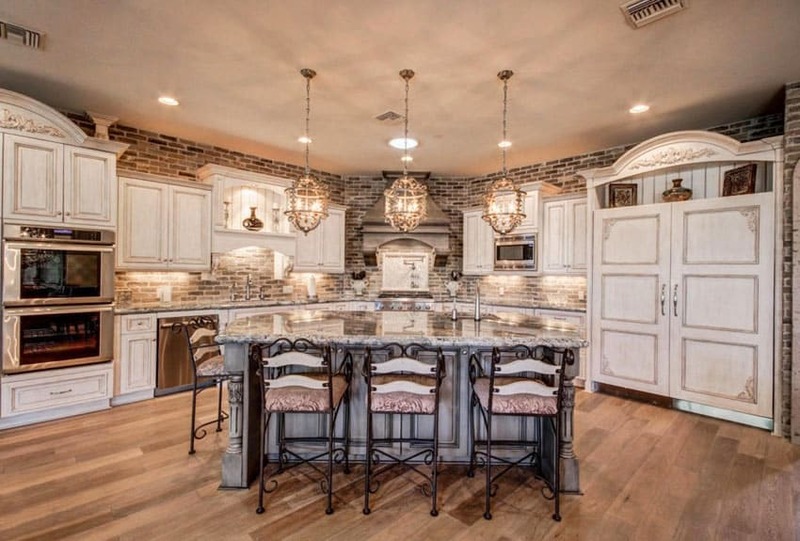 The fully brick walls of this traditional style kitchens helps complete the effect and look. The washed out pattern and texture given by the brick walls gives it more personality, and helps give it an edgier look. 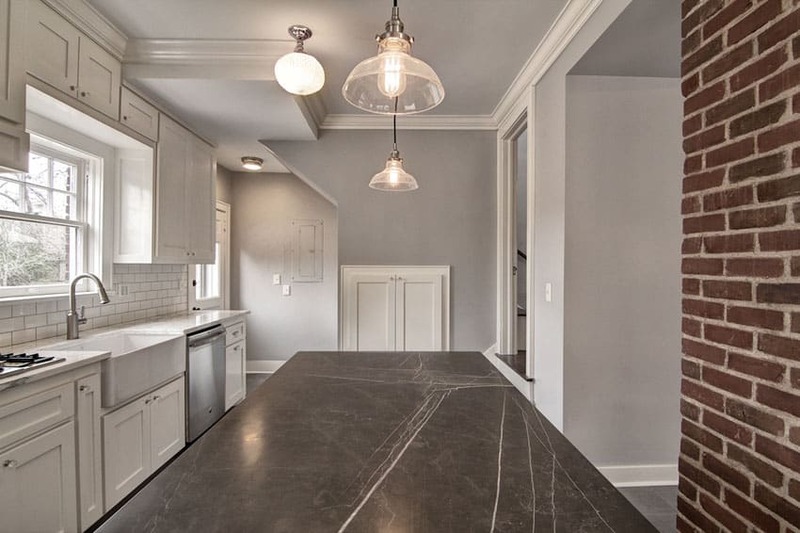 While the main kitchen cabinets uses light cream finish, the kitchen island uses an antique gray color for its base. 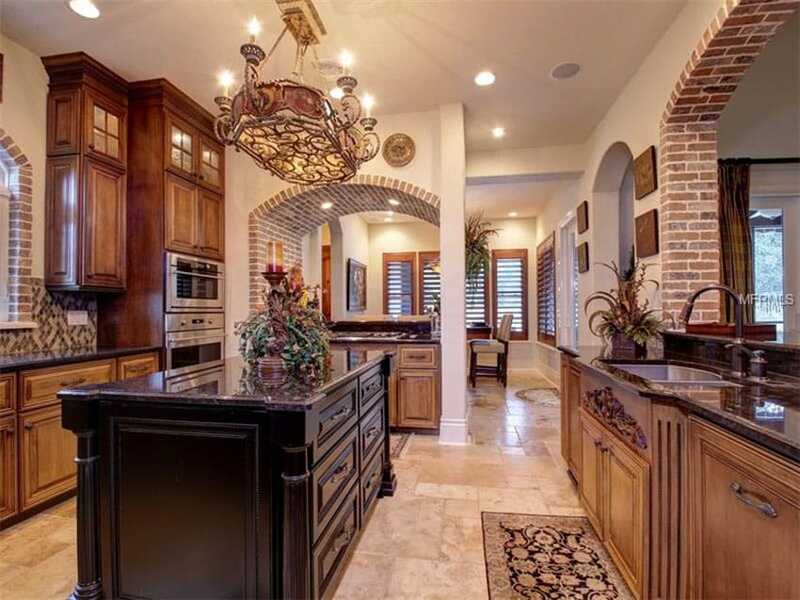 Right above it are three pendant lamps, adding to the elegant appeal of the kitchen. 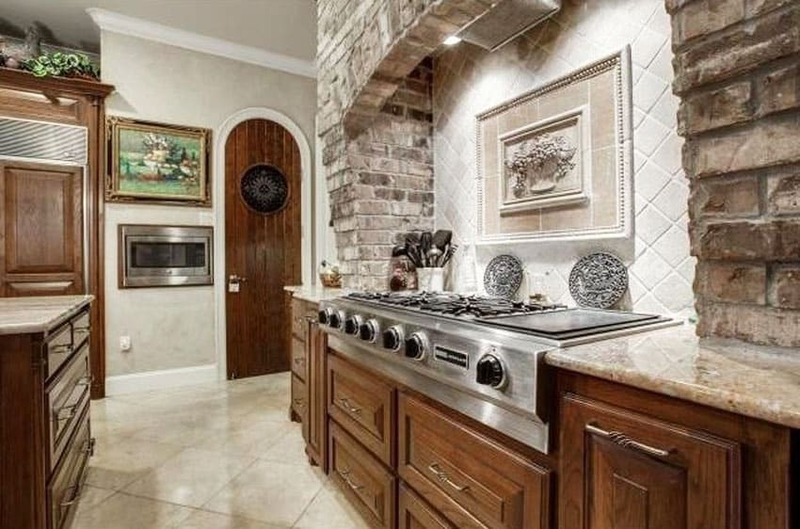 This galley kitchen tries to achieve the look of a traditional kitchen with multiple arched ceiling. To complete the effect, the ceiling has an arched brick design using a running bond pattern and the floors use a brick finish with a chevron pattern. In this traditional style kitchen, the bricks were simply used as accents for the arched openings and windows, adding a framed effect. The kitchen cabinets is a combination of solid oak and dark mahogany, topped with black granite. The faded brick surrounding the window panes and archways give the space an elegant feel. An open-plan kitchen with solid cherry wood kitchen cabinets and beige granite counter tops gives an elegant traditional look. Combined with orange-toned engineered wood floors and ceramic brick back splash, it gives an orange glow throughout the space, balanced by the white walls of the rest of the house. A compact modern kitchen which uses modular kitchen cabinets in white with light cream quartz counters. An l-shaped part of the kitchen walls is clad with red bricks, adding texture which contrasts with the white kitchen cabinets. Another modern kitchen which goes for a clean and elegant look. It uses traditional-inspired kitchen cabinets in white finish and topped with solid teak wood butcher’s block counter top. To add a little bit of texture & pattern, the back splash uses white-washed bricks. This small traditional style kitchen completes its traditional look by its combination of finishes. 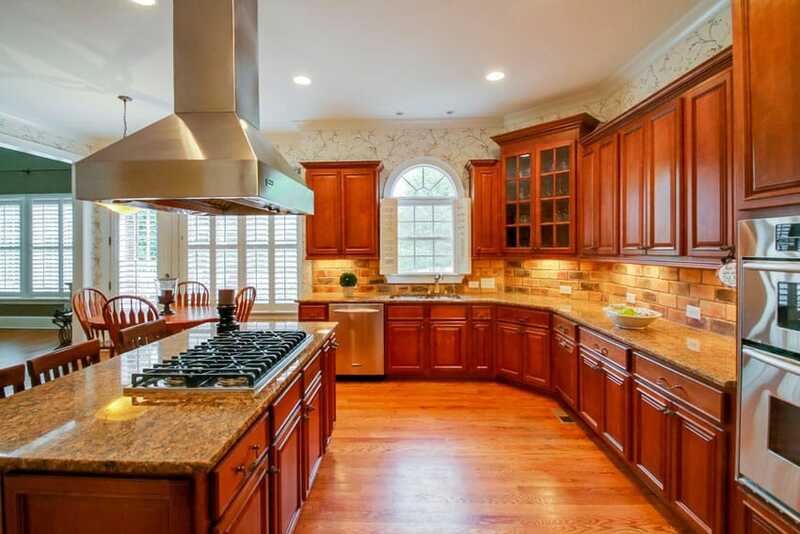 Solid walnut kitchen cabinets with traditional paneled design is combined with cream granite counters. In between two columns is the cook top, and an arched exhaust cover goes right above it. 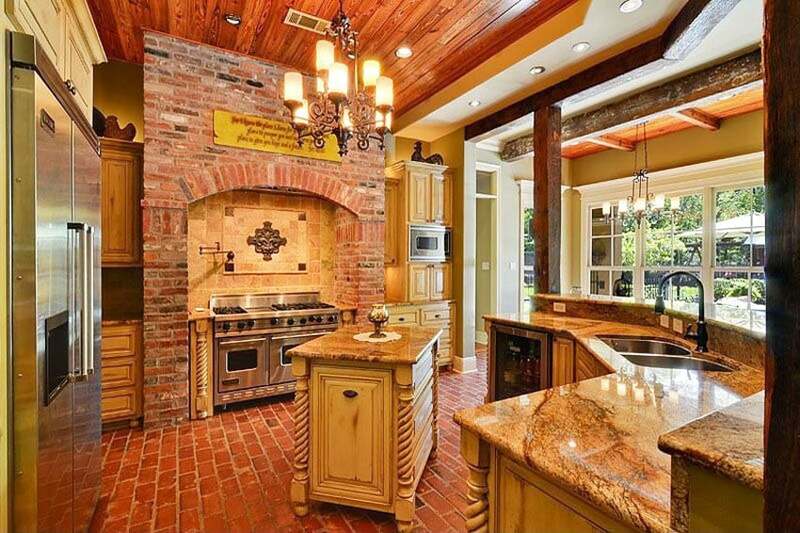 The columns and the arch were both finished with brick cladding to go with the over-all concept of the kitchen. This kitchen has a more modern look, combining white -painted cabinets with solid mahogany kitchen island. The kitchen has one wall clad in bricks with a built-in fireplace, and there is also a column clad in bricks, helping add texture. The previous examples uses terracotta or clay bricks, but this modern kitchen also uses a modern brick adaptation. To complement the modern white cabinets and beige granite are stainless steel tiles with a brick pattern. This back splash option is easier to maintain and clean, making it an ideal material choice. Kitchen cabinets of this kitchen all uses solid oak wood in its natural color, topped with light gray granite counter top. 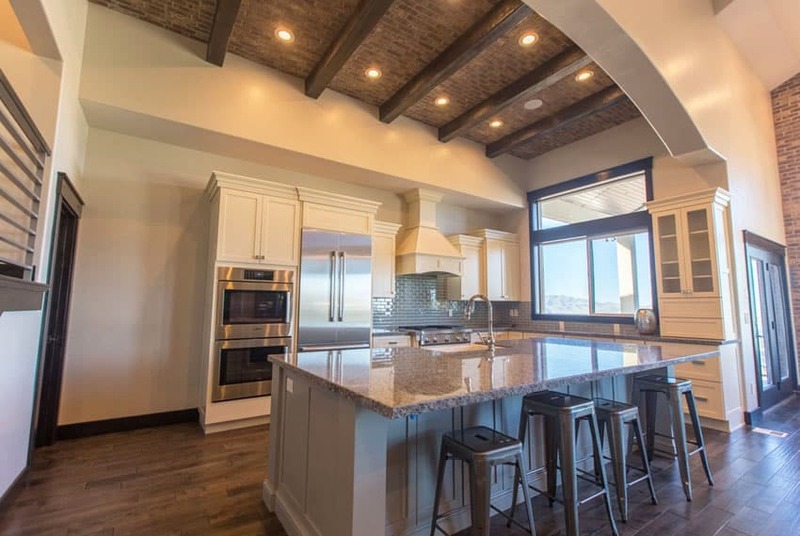 The ceiling has wooden beams, adding to the traditional effect, while the brick-patterned backsplash tiles in a combination of blue hues adds a more modern look to its surface. 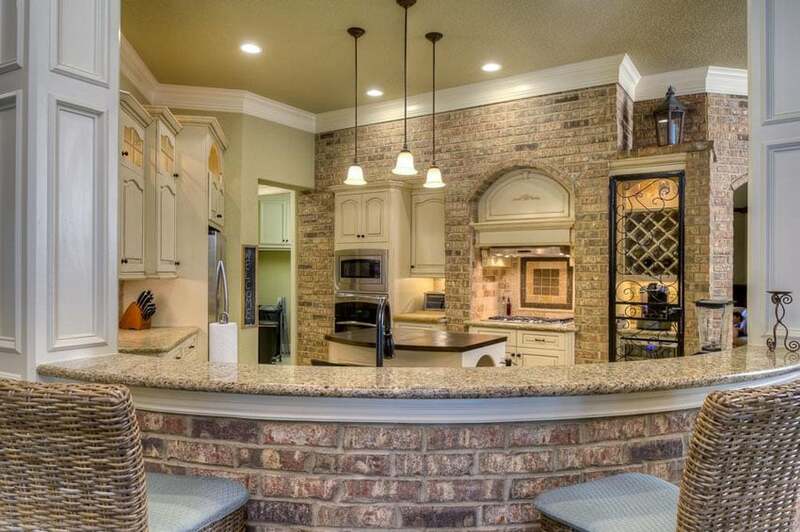 The brick-clad wall with arched exhaust cover really gives a bold accent wall in this traditional kitchen. 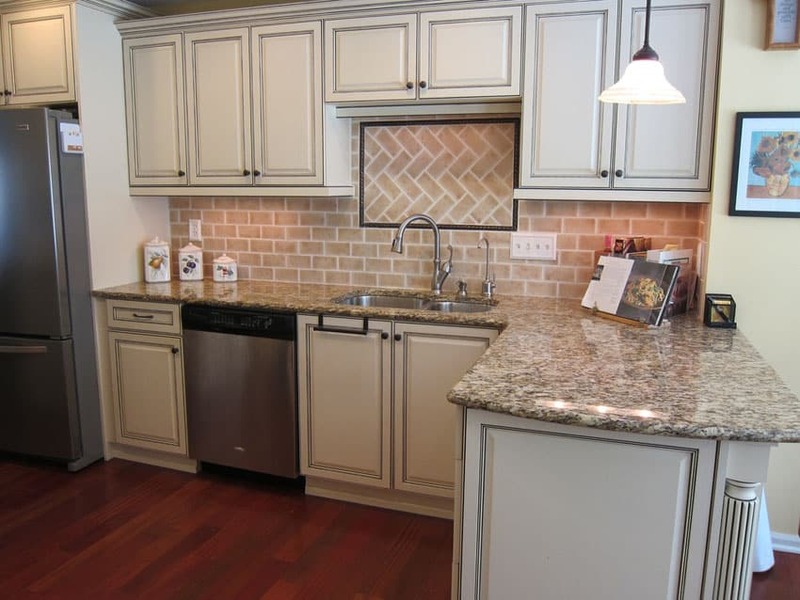 The cabinets are painted in a light cream color and topped with matching cream granite. The bold red of the brick accent wall gives an interesting focal point amidst the muted colors in this kitchen design. A small modern kitchen which focuses its color palette on reds and orange tones. Floors are engineered teak wood, while kitchen cabinets were laminated in cherry wood topped with white quartz to help tone down the reds. The back wall was clad in terracotta bricks, adding a small but interesting feature to the kitchen. White-painted bricks give the same effect of white subway tiles, giving this classic French-inspired kitchen a modern twist. This small kitchen has a simple & elegant look, using antique white finish with distressed edges for the cabinets & topping it with solid Mahogany butcher’s block counter. This Mid-century modern kitchen has a fun combination of colors and finishes which creates an eclectic yet cohesive look. Modular kitchen cabinets are all in white using black granite for the main counters and solid Teak for the kitchen island. 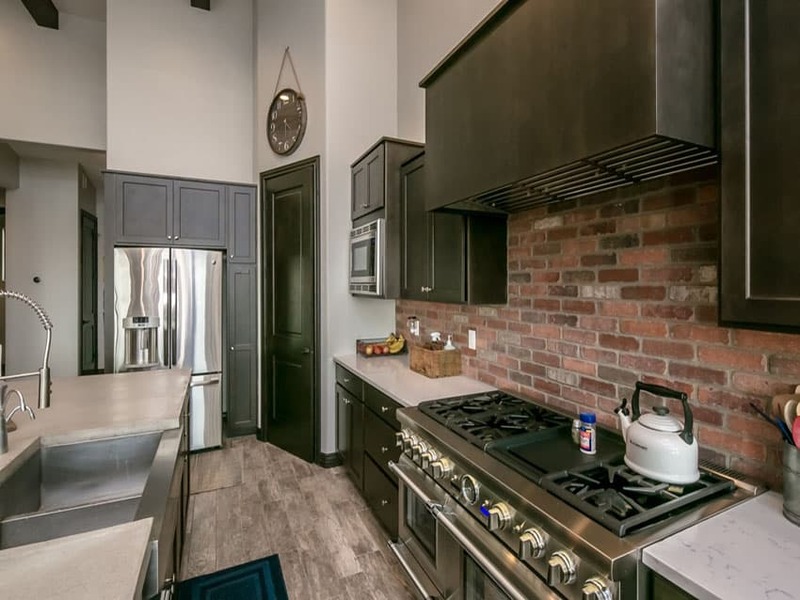 There is a fireplace wall along the walls of the main cabinets which is clad in terracotta bricks while the backsplash uses black-painted bricks with white grouting. The contrast of the two brick finishes creates an interesting visual appeal which looks perfectly in sync with the design concept. This is another mid-century style kitchen but has a more provincial/rustic inspiration. Pale wood finish floors tiles combined with white walls and brick accent wall provide the perfect background for the gray paneled kitchen cabinets with perfect white counters and faux white brick backsplash. This small kitchen has that relaxed rustic modern look, with an excellent combination of colors and finishes. Floors are light maple engineered wood, with white vertical wall sidings. The kitchen cabinets is a combination of fray and gunmetal gray, topped with solid concrete for that raw industrial look. There’s also a brick wall in which the main counters were set against, creating an excellent contrast between the bricks and the gray of the counters. 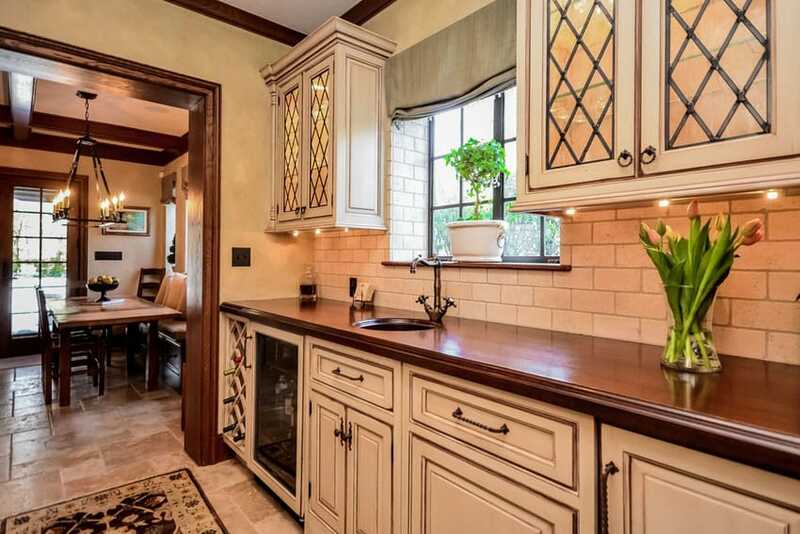 This classic kitchen has a small accent wall clad in antiqued bricks. Against the accent wall is a free-standing retro oven painted in black, creating an interesting focal point/center – piece. Main kitchen cabinets are paneled Mahogany cabinets with white marble counter top and a built-in ceramic sink. 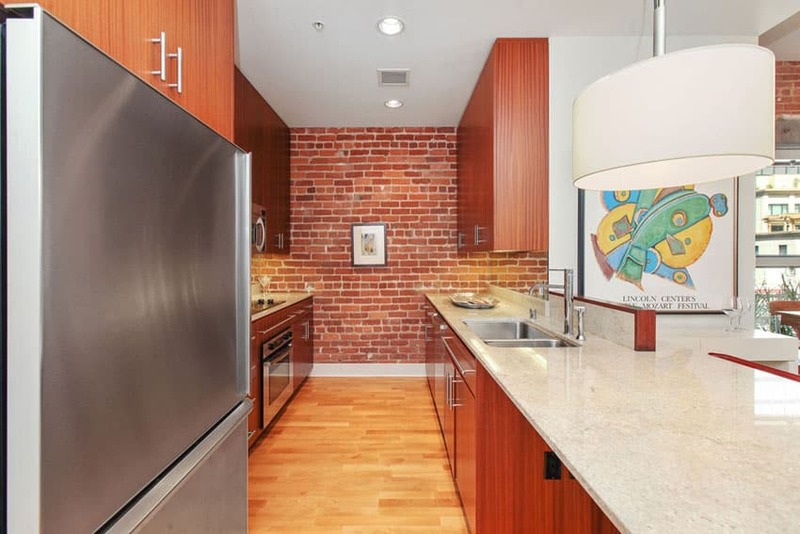 The wall in which the kitchen cabinets are against is completely clad in large pieces of bricks, creating a large texture/pattern on its surface. The same bricks were used for the floors, creating a continuity of patterns, but the material repetition has a tendency to make the space look too busy so to balance it out, white was the color of choice for the kitchen cabinets, while gray was used for the counter top. A very large traditional style kitchen which uses solid cherry wood floors, creating a bold background for this kitchen. The kitchen cabinets are of solid walnut with beige granite counters, while the kitchen island has a light fray base with beige soapstone. Surrounding the range cooker is a built-up wall and exhaust cover clad with bricks, to make it look like an old fireplace. 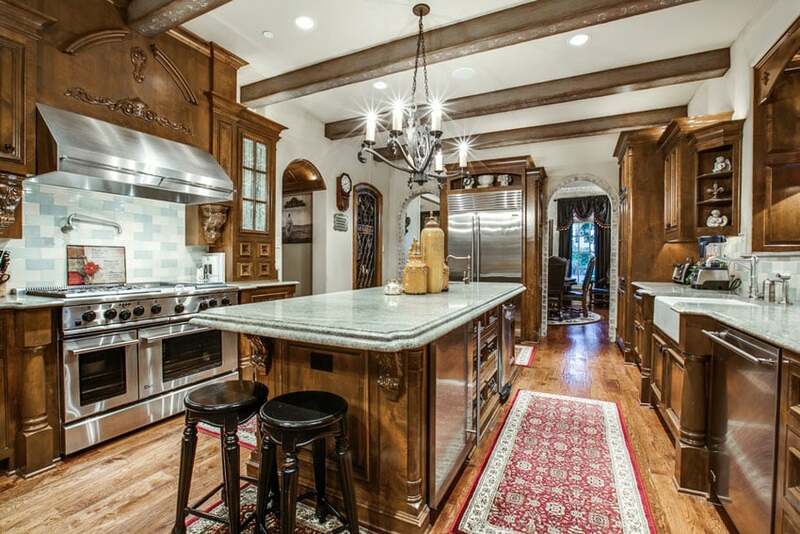 This unique rustic style kitchen embraces its architecture and adapts its design to match. 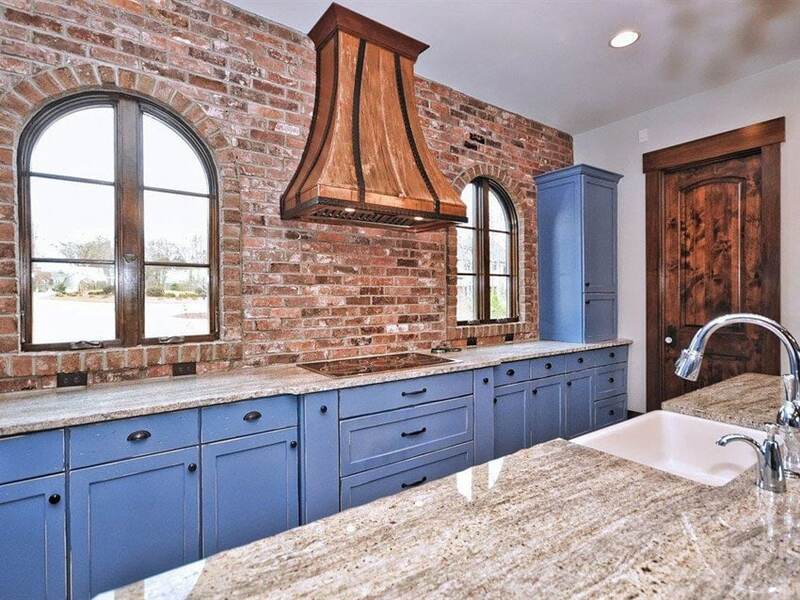 Against the brick walls are antique/weathered finish kitchen cabinets in a unique blue shade topped with soapstone counters. To tone down the rough finishes, the rest of the walls were kept plain white, including the ceiling. 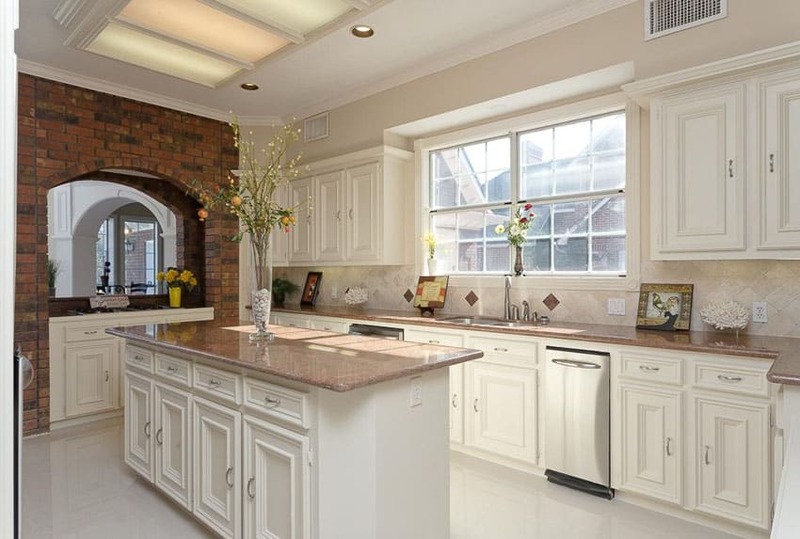 An elegant transitional style kitchen with a semi-open layout, separated from the rest of the house only with a large archway clad with bricks. The kitchen uses simplefied paneled cabinets in white with gray backsplash tiles with subtle geometric patterns, giving the design a modern touch. This modern kitchen uses a built-up wall clad with terracotta bricks, creating a faux archway opening, as well as creating a niche for the built-in ovens. The cream laminated counters were topped with gray solid surface, while for the backsplash, emerald green ceramic tiles were used, giving it a shabby chic appeal. 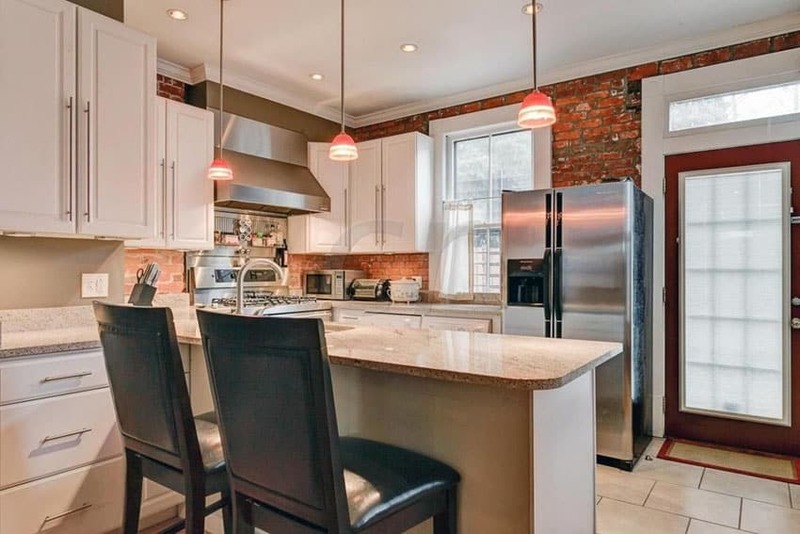 Instead of simply painting the built-up walls in which the cabinets were built in to, this kitchen uses brick print wallpaper to achieve this look without taking up too much thickness and without the grease-prone crevices typical to real brick walls. This transitional style kitchen takes inspiration from provincial rustic kitchens, using white kitchen cabinets with vertical wood panels and combining it with solid teak butcher’s block counters. The kitchen indirectly parallel to the dining area, which in turn is separated from the living area with a large arch opening clad with bricks. Intricate paneling on the kitchen cabinet doors gives this kitchen that elegant appeal. Paired with light cream walls, this kitchen is definitely laid back and looks relaxing. One side of the kitchen wall has a built-up wall with arched opening which acts as a ‘window’ towards the other parts of the house. 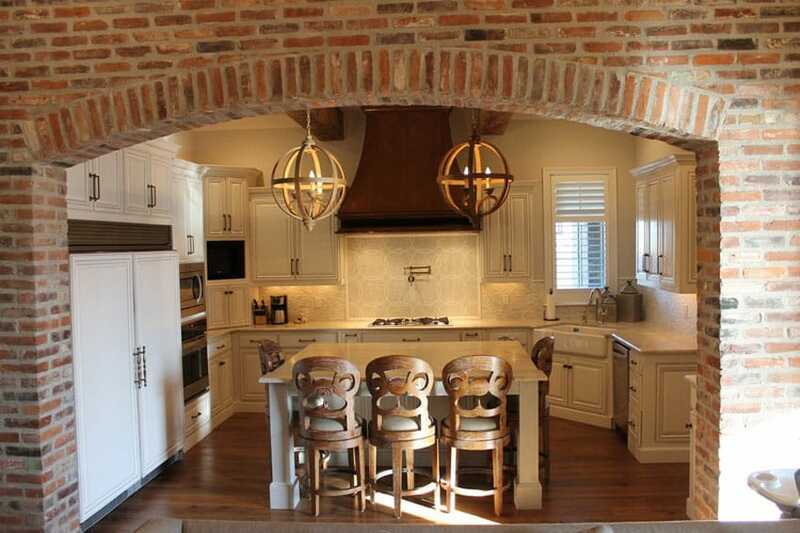 In this traditional kitchen design, the brick finish was surprisingly applied on the ceiling, instead of the walls. There’s a large recessed ceiling right above the kitchen with brick cladding, while the kitchen itself features basic traditional style kitchen cabinets using oak wood and cream granite counters. 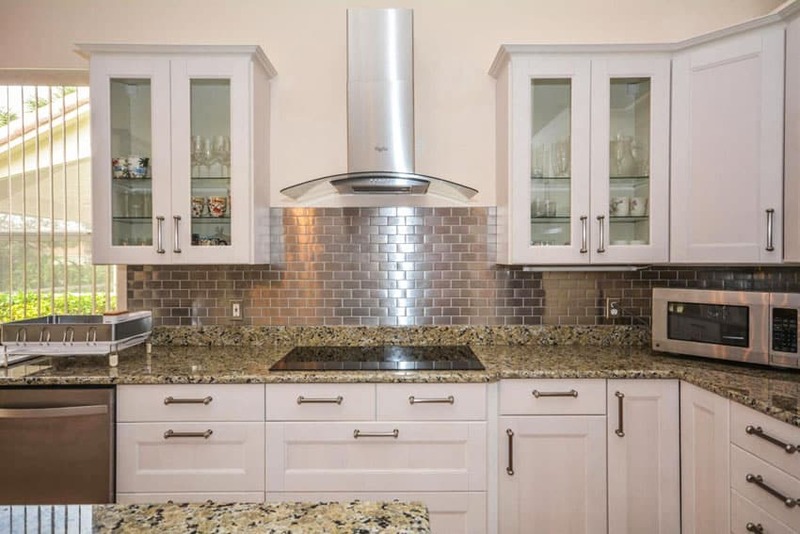 Brick Backsplash – available in a wide variety of styles and finishes, brick backsplash is one of the easiest ways to get the look of brick in your kitchen. Brick mosaic tiles can give you a traditional, contemporary or modern look depending on the type you install. Open Pipe Shelving – brick is exposed to plumbing pipe shelf units which are located on either side of the sink. It promotes an industrial loft feeling while in the kitchen. 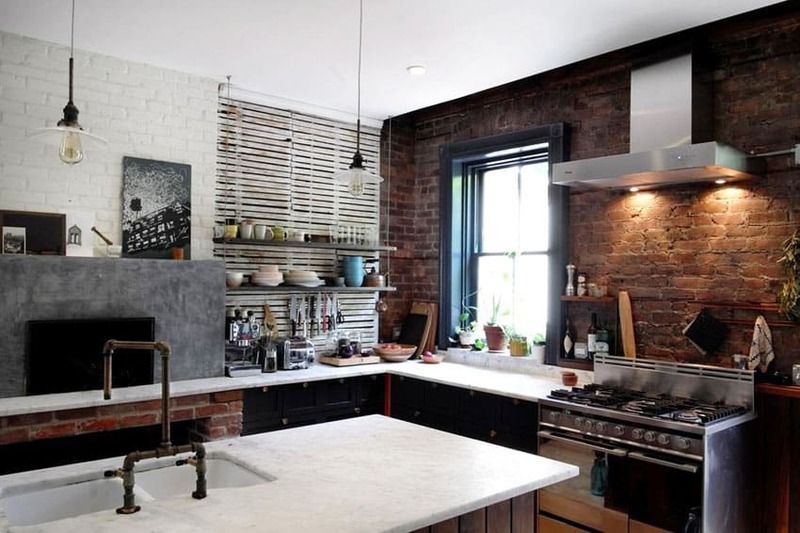 Faded Brick – there is a perfect balance when faded brick is used together with floating shelves. 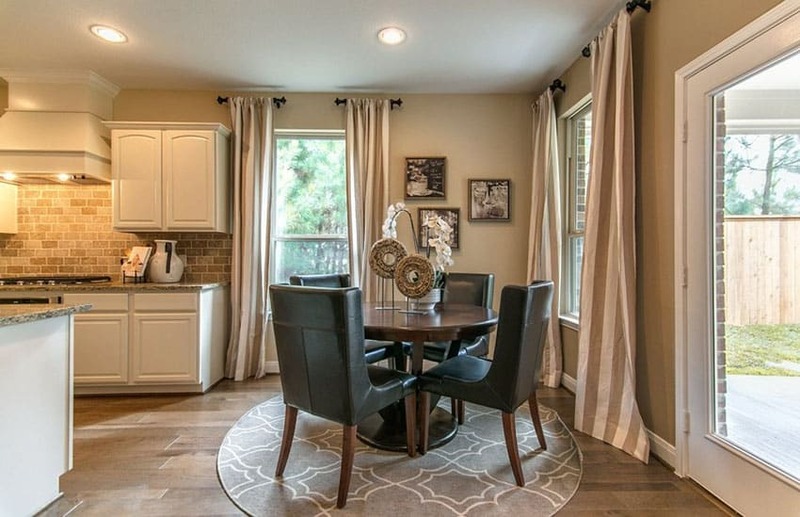 The natural fiber shades add warmth to the kitchen ambiance. 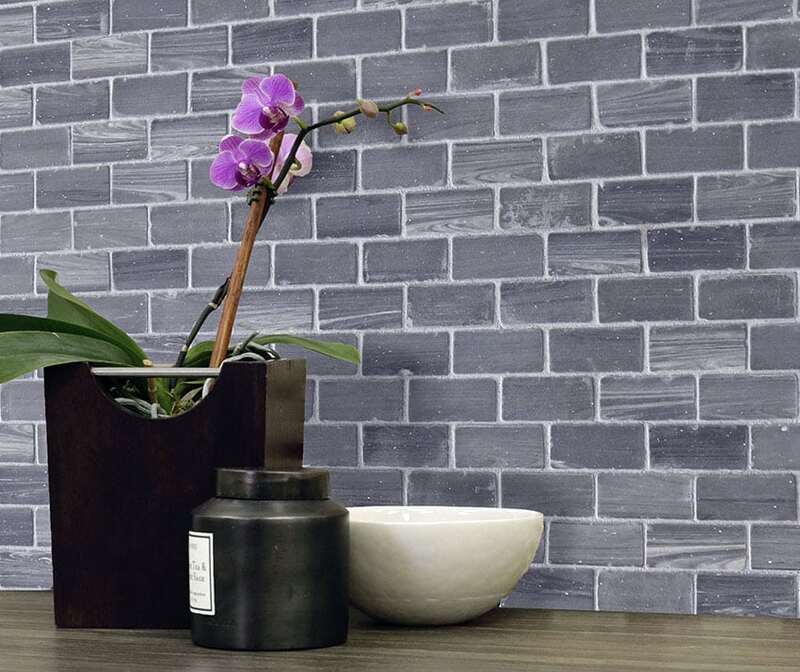 Striped Brick – it uses stripes of painted brick for the creation of visual interest on kitchen walls. Pots and pans can be hung to complete the look of a true chefs kitchen. 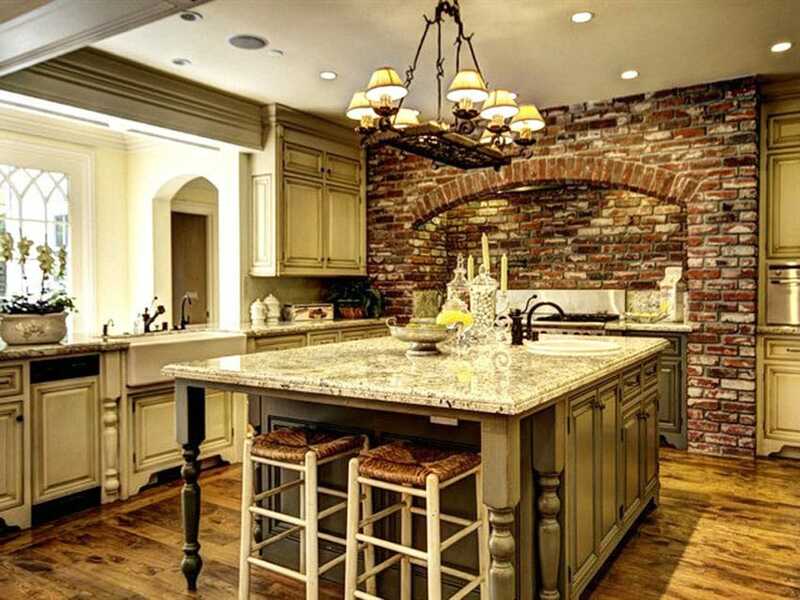 Washed Out Brick – mute colors of faded brick wall fits well with colorful cabinets and offers contrast for countertops. Mirrored Backsplash next to brick – mirror adds contrast to bricks and a patina that balances between wood cabinets and rough, earthy brick. A transitional kitchen space combining rustic finishes to achieve this rugged yet elegant look. Modular kitchen cabinets were painted in a gunmetal gray color and topped with white solid surface for that modern masculine look. Using weathered wood effect floor tiles and faux brick ceramic tiles for the backsplash enhances the rustic appeal of the space, making it a perfect kitchen for any bachelor’s pad. Another transitional style kitchen adapting a clean and crisp-looking white and wood combination. 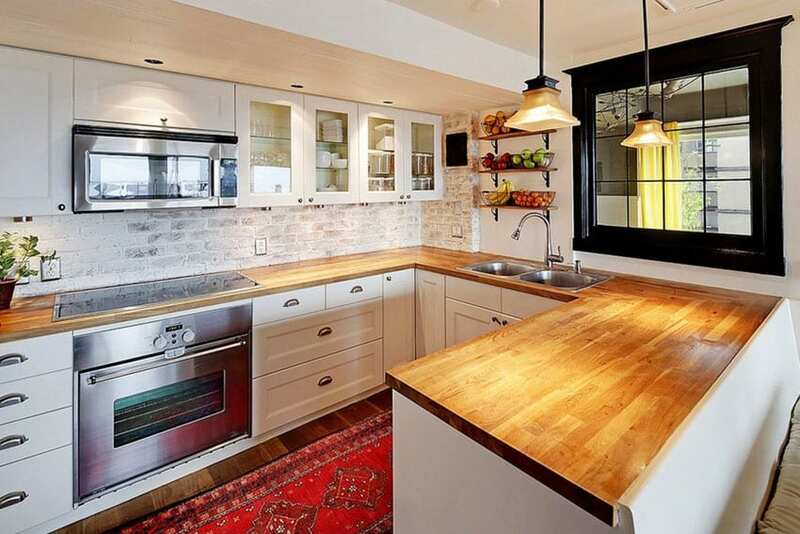 The cabinets are white, while the counter top uses cherry wood butcher’s block. 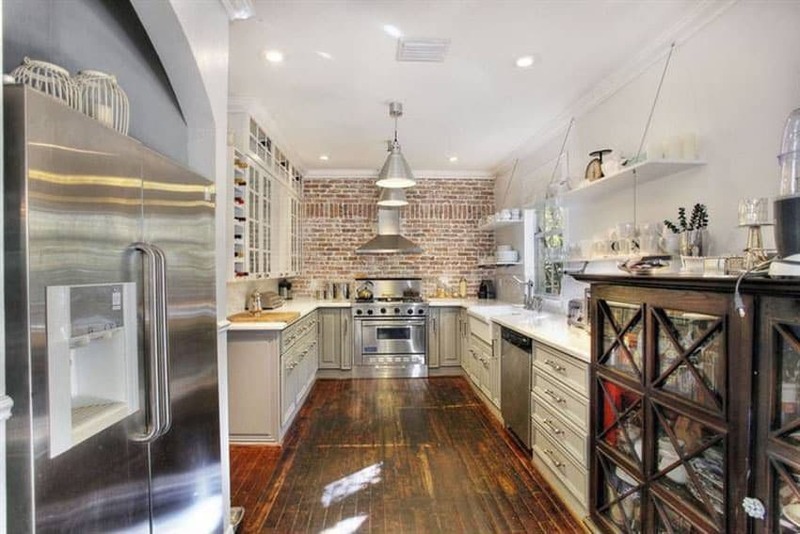 There’s an exposed column with brick cladding jutting out of the left wall, and for the backsplash, white glass mosaic tiles with brick pattern was used. 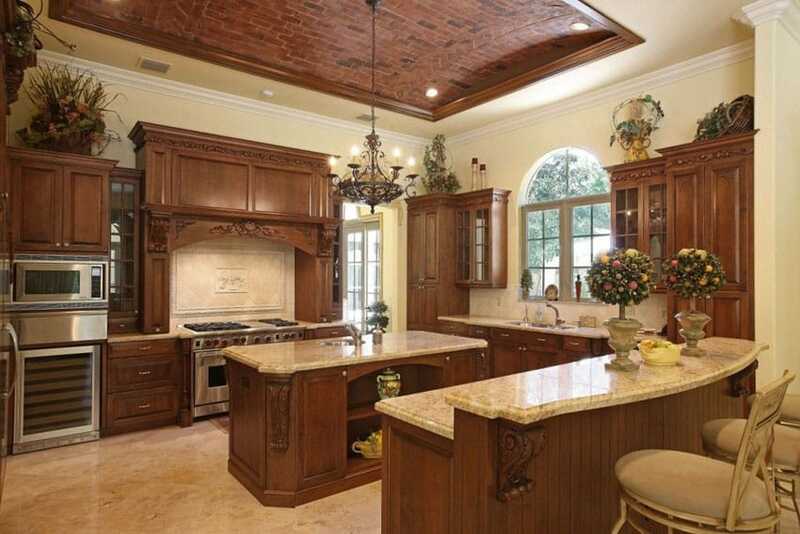 There’s a certain feeling of grandeur and elegance in this kitchen due to its very high ceiling. 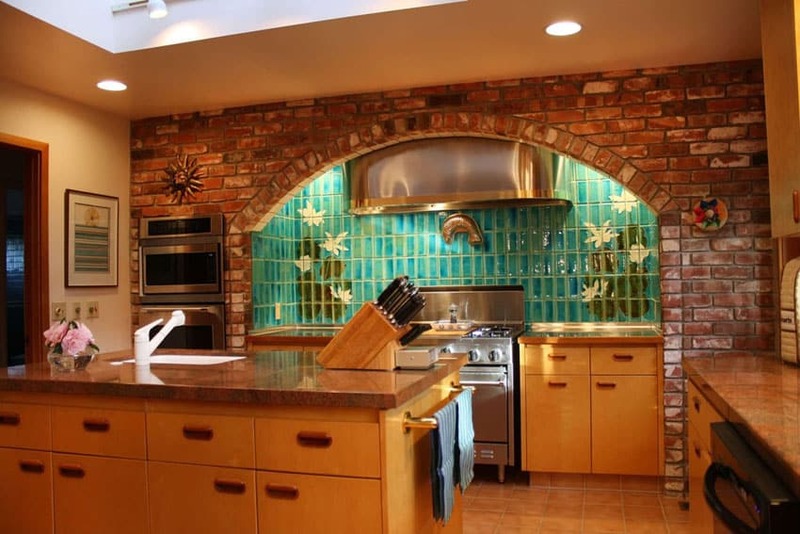 Glass brick backsplash tiles in an aqua color give a contemporary feel. Looking up, you will see the bricks on the ceiling surface and wooden beams spanning the ceiling. In contrast to the busy ceiling are plain white walls and simple white kitchen cabinets painted red with a massive gray kitchen island. This is a compact kitchen with a traditional cabinet design which uses white-washed bricks for its backsplash,in a combination of running bond and chevron patterns. In this modern transitional style kitchen, brick patterned ceramic tiles were used as backsplash material as it is able to give you the rustic look of real bricks, but has a smoother surface and has less crevices which can accumulate dirt or grease. A minimalist transitional kitchen design adds more personality to the space by adding a brick accent wall on the side. The small accent wall helped add texture and color to the space without overwhelming the white cabinets and black soapstone of the counters. The brick tiles used in this modern transitional style kitchen are made from gray soapstone, giving it an elegant natural satin finish. The gray color is very subtle and soft, perfect for the black solid surface and white cabinets.